Soft Stride is a comprehensive line of flexible foot orthotics that addresses many specific ailments and injuries to feet, heels, ankles, arches and legs. These products help patients avoid or delay surgery, attenuate shock and provide pain relief. Athletes receive comfort during strenuous training and people who stand for long periods benefit from decreased fatigue and pain. The viscoelastic polymer mimics the qualities of soft body tissue. This unique polymer provides redistributes pressure and attenuates impact. 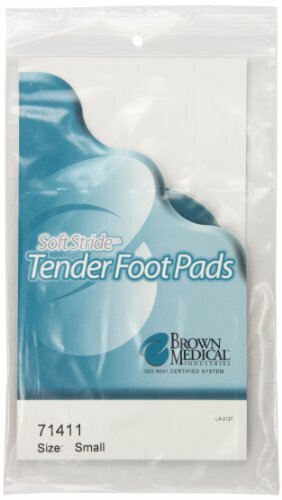 Tender Foot Pads are superior for separating the metatarsal shafts and cushioning the metatarsal heads. Unique design alleviates pain and discomfort in forefoot. Each spine or ridge on the Tender Foot Pads should align with each web space of forefoot. Downsizing one size is useful technique to help accentuate the transverse arch. Use as conservative approach to general forefoot pain and treatment of Morton’s neuroma. These products help patients avoid or delay surgery, attenuate shock and provide pain relief. The viscoelastic polymer mimics the qualities of soft body tissue. Soft Stride is a comprehensive line of flexible foot orthotics that addresses many specific ailments and injuries to feet, heels, ankles, arches and legs. Athletes receive comfort during strenuous training and people who stand for long periods benefit from decreased fatigue and pain.